This image comes from the Meridean View Centre atop the DiWang building in Shenzhen. 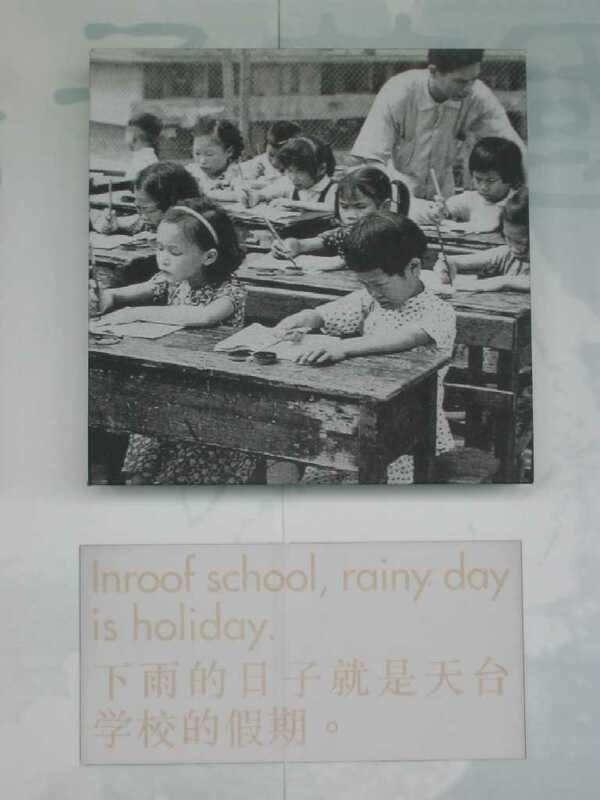 In case you're wondering exactly what an 'Inroof school' is, it's talking about school in Hong Kong many years ago. When the buildings were shorter and less stylistic they used to have open-air schools on the flat rooftops of the buildings. Space has always been at a premium in Hong Kong, so the poorer schools were forced outdoors. School was cancelled if it rained, which was quite a common thing in summer time. I can just imagine the teachers trying to control the class as the sights and smells of the city came wafting through the lessons. I have 10 teeth that require some form of dental treatment. 10! One of my molars is currently undergoing a full root canal, two have conventional small cavities and 7 teeth where the enamel has worn away at the gum line due to softening of the enamel and by being brushed too vigorously with a brush that is too hard. The first visit consisted of the usual scale and clean as well as two X-rays. The X-ray machine was really cool, just a tube-like thing about 8cm in diameter that they put up to the side of my face. The X-rays showed that a tiny hole in the enamel of one of my molars had been eating away at the soft tooth underneath. On the second visit the repair work began. The dentist built two of the teeth that were worn at the gum line back up and started the root canal treatment. She opened up the top of the tooth, confirmed that the cavity had gone all the way into the tooth pulp, and proceeded to extract all the tooth pulp, clean out the tooth roots with some really neat little files, fill the tooth with a treatment chemical and put a temporary filling on top. She also took another X-ray to confirm the depth of the roots of the tooth. All of this took about an hour. I asked the dentist why my teeth have degenerated so quickly after moving to China. She said that it's not all that un-common for foreigners moving to China to suffer teeth problems. She attributed it to the absence of fluoride in the water and more use of sugars and other plaque-feeding ingredients in food. It seems this has been one of those little 'gotcha's' that comes from living in a less developed country. People moving to China soon - be warned. Good thing I actually enjoy a trip to the dentist. I've never quite understood those that fear dentists and their cool tools. Lately we've been doing, and will be doing, some regular trips to Hong Kong. This will give us a few more opportunities to see and experience more of what Hong Kong has to offer. 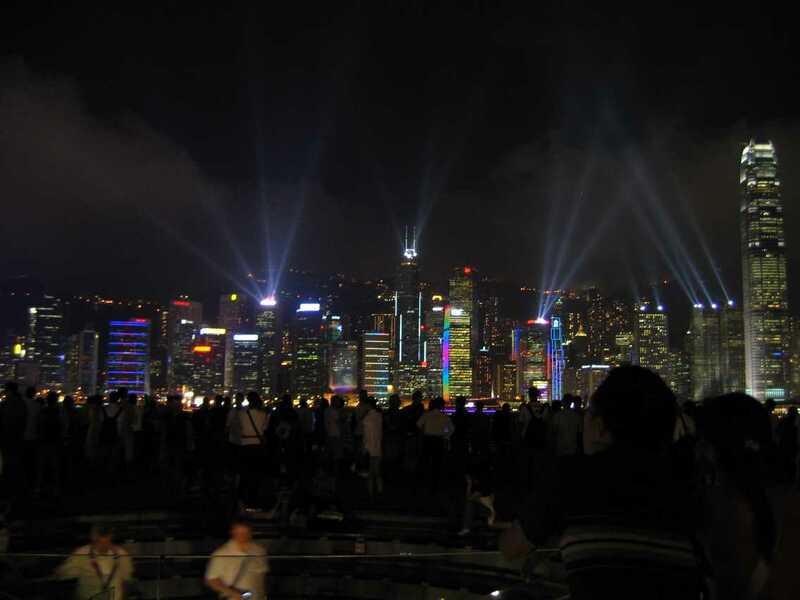 Every night Hong Kong puts on a light show across the harbour, called the Symphony of Lights. It starts at 8pm and goes for about 20 minutes. It involves 37 buildings and the buildings flash and dance to musical accompaniment. You need to be at the Tsim Sha Tsui waterfront between the Avenue of Stars and the Hong Kong Cultural Centre to get the musical accompaniment. Fireworks are added for special occasions, such as Chinese New Year. The show has received so much international attention that it's been named as the World’s Largest Permanent Light and Sound Show by Guinness World Records. There's also a dedicated website that goes into more detail about the show. Last night Gail took a short piece of video, right at the end of the show. If you can imagine this scaled across all the buildings in the harbour you'll start to get an idea of the magnitude of the effort that they've gone to. So much for global warming eh? To the tune of "Be our Guest" from Disney's Beauty and the Beast. How I despise you MSG. Even though I've drunk much tea! How I abhor you MSG. I am dizzy till past three! How I detest you MSG. But that does not include me! How I revile you MSG. MSG, you're not for me! A lot of the food here in China is laced with MSG. It's so common in the food that the after-effects are sometimes called 'Chinese Restaurant Syndrome'. Sometimes I'll get light-headed after eating a meal that's heavy in MSG, other times I'll get a mild headache. It takes a lot of effort to eat out at a restaurant and have MSG-free meals. It's Alive! I have successfully resurrected my temporarily deceased Acer laptop. This makes me really happy . No data has been lost. I suspected a BIOS failure of some sort, but it wasn't making any attempt to start up, save for a few of the correct LEDs blinking. I took it in to the Acer repair centre in Hong Kong who, after keeping it for 4 days and charging a HK$300 inspection fee, told me that the main board was dead and needed to be replaced, at an all-up cost of approximately HK$3500 (AU$550). I took it back from them and decided to do some more research myself. I discovered a forum post where a guy with an Acer had killed it during a BIOS update and had successfully removed the BIOS Flash chip, reprogrammed it (using an identical programmer to one we have at work), and brought it back to life. I started down this path and completely disassembled the laptop. I decided to keep looking on the net and came across some forum entries that described how to recover some other notebooks from BIOS problems. It seems that if the machine has a Phoenix BIOS then it supports a Crisis Recovery Mode, where you can connect an external USB floppy drive, hold down the correct keys and then connect power and turn on the laptop. If the right files are on the floppy then they'll be read and loaded into the BIOS. I reassembled the laptop to give this a go. I took a trip to the local computer market and bought a floppy disk for 3 RMB. This place is 4 floors of every electronic component imaginable, with 2 floors dedicated to PC parts. It also reeks of stale cigarettes like nothing else. After each trip there I had to shower and change my clothes and I was only there for 10 minutes! It seems there are several versions of this Crisis Recovery Tool available. I downloaded one from a forum, one from HP and one from Compaq. I ended up using the one that made the floppy disk with a *.WPH BIOS file, the same file type as the one provided for my notebook by Acer. I held down the Fn +Esc keys on my dead laptop, powered it up and… nothing. I managed to deduce from the error beep codes from the Acer UK website that the notebook couldn't locate the BIOS file. After many attempts I guessed that my Imation LS-120 Superdrive wasn't being detected the same way as a regular floppy, so back to the electronics market I went to buy a real FDD for 60 RMB. I re-created the Crisis Recovery Disk using the new floppy drive. This time when I entered Crisis Recovery Mode the laptop gave a repetitive beeping sound, which indicated that the BIOS was being re-programmed. There were 3 BIOS files on the Acer Australia website, one for ATI video (mine), one for Intel video and one to suit Vista that supports both video formats. The first one didn't work, so I loaded up the one for Vista and viola! My laptop came back to life. Download the correct BIOS file for the laptop from the Acer website. Download the CrisDisk Crisis Recovery Tool from wherever you can find it. Create the Crisis Recovery Disk using a USB floppy disk drive. Overwrite the BIOS file on the floppy disk with the one for my laptop. Connect the USB floppy disk drive to the dead laptop. Hold down Fn + Esc on the laptop, connect the power and press the power button. Wait whilst the laptop beeps, wait for another few minutes after the beeping stops since this is when the BIOS file is actually being written. Reboot and enjoy the paperweight becoming a laptop once again. I was a bit annoyed with Acer at this point for two reasons. Firstly, they didn't really try to fix my laptop, they were only interested in replacing the motherboard. I guess all these corporations are like this but it's not a good feeling when you know that you're being deliberately ripped off. My second annoyance was that one of the BIOS files on the Acer website that was specifically for my laptop actually didn't work. I wonder how many other paperweights are out there. Still, now I'm a happy camper again because I recovered my laptop for the equivalent of only about AU$60 and a sum total of a day of my time .